Saving the planet is a tough job. It just got easier. The array of so-called “Green” products on the market is dizzying and often misleading. Consumers need one reference book that clearly lays out what is the better choice—between brands, benefits, and costs. Just GREEN It! 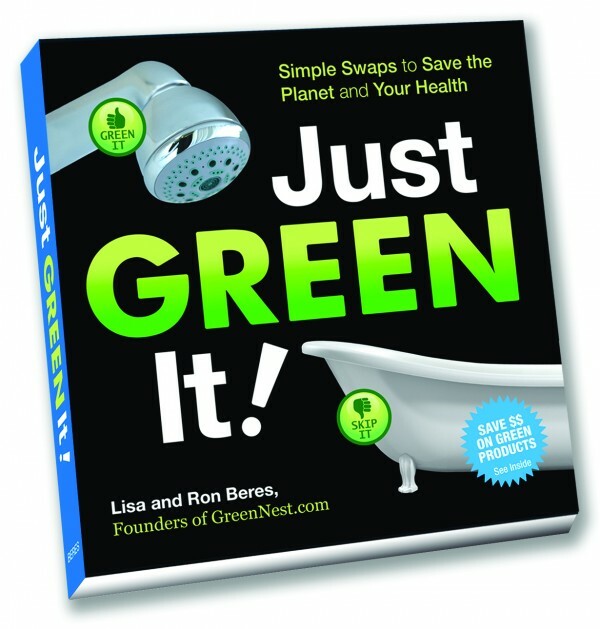 by Ron and Lisa Beres, certified green building professionals (CGBP), Building Biologists (BBEC) and owners of the popular Web site GreenNest.com, explains in an easy visual format exactly which products—from household appliances and cleaning tools to food, cosmetics, and clothing—are the best for the planet and also healthy for you, your kids, your home, and your budget. Authors Ron and Lisa Beres debunk the “greenwashing” that is so prevalent in today’s marketing and teach readers how to know the difference between such confusing and often deceiving terms as “natural,” “organic,” “chemical-free,” and “non-toxic,” among others. While the Green Movement is concerned about the effects of our collective carbon footprint on the planet, the Beres’ are equally concerned with how our footprint is endangering the health and well being of each individual. Finally, with Just GREEN It! there’s a guidebook for navigating the oversaturated Green marketplace. It’s truly a must have for today’s consumer to decipher fact from fiction, live a healthier lifestyle, and exercise not just their voice, but their purchasing power as well. You can win a copy of Just GREEN It! personally signed by the authors, just by leaving your own green tip in the comments below. The winner will be drawn by random selection on June 11, 2010. Be sure to include your email address so we have a way to notify you! Thanks for having a book that consolidates information on the broad topic of living green. It’s great as a resource for looking up healthy ways to live and steps to take to reduce dependence on non-sustainable products. Thanks Sunnymay! We apprecite your valuable feedback :-) Word of mouth is so important and your voice helps spread the message to others. Thanks again & have a happy, healthy day! My favorite green tip is using cinnamon and pepper for pest control. We get flying ants in Colorado and sprinkle both along the door frame leading to our deck. It keeps the ants out and our three-year-old safe! Great tip Mama Bird! This is a great example. There are so many other examples in our new book, Just Green It! Coffee grounds and soapy water are also good around the perimeter of picnic table legs for these summer months. Thanks for sharing!